Win this deadly race by choosing your car and avoid taking damage along the race. Don't hit the obstacles. 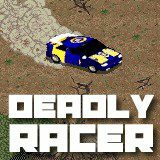 Deadly racer is a game for the most active players who struggle to win each and every race. Speed up and avoid obstacles and other players.